Oman is a country of diverse natural beauties and fascinating human history. Please enjoy this video presentation from the Ministry of Tourism in Oman. 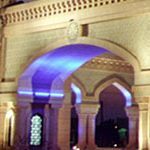 Oman’s unique story reveals examples of great moral strength, courage, heroism, maritime skills, scholarship and hard work that have together moulded the Sultanate into its present form. By drawing our attention to the noble efforts of distinguished Omanis, historians have provided us with a deeper understanding of the great wealth of human experience that is at the foundation of modern Oman. The earliest Stone Age settlement discovered in Oman is in the Wattaya district and dates back more than 10,000 years. 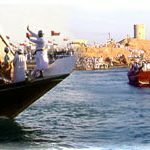 By the Middle Ages, Oman had established itself as a prosperous seafaring nation, sending dhows from its great port at Sohar to trade with merchants in far flung destinations. 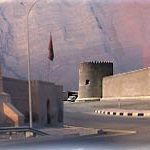 It seems likely that at this time Sohar was one of the largest and most important cities in the Arab world. Historical studies have revealed extensive ties between Oman and the civilizations of the ancient East including China, India, Mesopotamia, as well as the Eastern Mediterranean, the Nile Valley and North Africa. The rule of the Imams in Oman began in the eighth century when Al-Julanda bin Masood was elected as the first Imam in 751AD and his reign lasted intermittently for four centuries until 1154 AD. The Nabhani dynasty took control of Oman 1154 AD and the Nabhani kings ruled Oman for four and a half centuries. In the early 16th century the powerful Portuguese trading empire sought to extend its influence and reduce Oman’s control over the thriving Arabian Sea and Indian Ocean routes. Portuguese troops invaded Oman and captured some of the coastal areas including Muscat, occupying it for nearly 150 years before being defeated by Sultan bin Saif Al Ya’rubi. 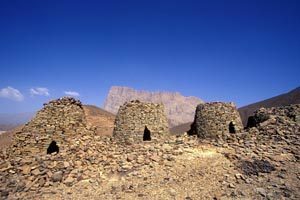 During the Ya’ruba period (1624 – 1744 AD) Oman entered an era of prosperity at home and abroad, and many of the Sultanate’s historic buildings and forts date from this time. As the Ya’ruba dynasty expanded the Portuguese and Omanis engaged in many battles for control of East Africa, until in 1698 AD the entire East African shore from Mombassa to Kilwa fell under Omani control. However, expansion ended when civil war erupted between rival Omani tribes over the election of a new Imam. Persian forces seized the opportunity to invade and some coastal areas found themselves under foreign occupation once again. Despite repeated attempts from 1737-1744 AD, the Persian invasions were not to achieve their objective of subduing Oman. Oman’s heroic resistance staved off the Persian invasion, which was to be the last foreign invasion into Oman, and their ultimate victory is owing to the leadership of Ahmed bin Said Al-Busaidi who succeeded in ousting the Persians from Oman and was elected Imam in 1744 AD. Over the past two hundred and fifty-plus years, the Al Busaidi state founded by Imam Ahmed bin Said, of which Sultan Qaboos bin Said is a descendant, has succeeded in making Oman the powerful and influential state we know today. The country went on to establish political links with the other great powers of the time, including Britain, France, the Netherlands and the United States. However, the path to prosperity has not always run smoothly. There have been some periods of weakness, isolation and internal conflict which, for various domestic, regional and international reasons, led the country to turn in on itself and become cut off from the outside world. Fortunately, this situation came to an end in 1970, when the foundation stones of contemporary 21st century Oman was laid. In 1970 His Majesty Sultan Qaboos bin Said, the Crowning Glory of Oman, inaugurated the renaissance and modern age of Oman. The Sultanate of Oman occupies the south-eastern tip of the Arabian Peninsula and lies between latitudes 16° 40′ and 26° 20′ north, and longitudes 51° 50′ and 59° 40′ east.The total area is approximately 309,500 km2 and it is the third largest country in the Arabian Peninsula.Oman’s coastline extends 3,165 km from the Strait of Hormuz in the north, to the borders of the Republic of Yemen in the south and shares its coast with three seas: the Arabian Gulf, the Gulf of Oman and the Arabian Sea. It also comprises a number of islands off the coast, among them the islands of Masirah, Halanyat and Salama. The Sultanate borders the Kingdom of Saudi Arabia in the west, the United Arab Emirates in the northeast, the Republic of Yemen in the southwest, the Strait of Hormuz in the north and the Arabian Sea in the east. 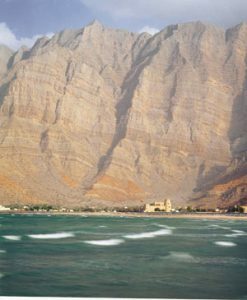 The Musandam Peninsula forms the country’s northern tip. It is the only coast the Sultanate has on the Arabian Gulf and is just over 50 km south of the Islamic Republic of Iran across the Strait of Hormuz. Oman possesses a rich and diverse topography that divides the country naturally into three distinct regions. 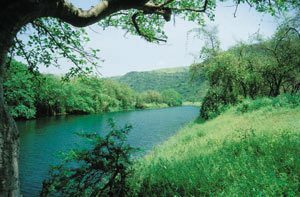 These regions range from rugged mountains and deep fjords in the north, to the spectacular dunes of the Wahiba Sands and the large salt flats in the centre, to the lush green hills of the Dhofar region in the south. A rugged and varied coastline stretches from north to south. 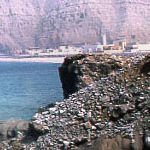 The northern coastal strip along the Sea of Oman is known as the Batinah Coast, a narrow fertile plain separated from the rest of the country by the Hajar Mountains. The highest peak in the Hajar is Jabal Shams (Sun Mountain) which rises to 3,009m. The southern slopes of the range are notable for their oasis towns where date groves flourish in the dry, desert air. In the south lies the second mountain range in Oman, the Qara Mountains. These attract the light monsoon rains during the mid-summer months, turning them green with vegetation, whose roots help delay the effects of erosion, resulting in a soft rolling landscape more akin to Central Africa. As in the north, a narrow, fertile, coastal plain lies between the mountains and the sea. The city of Salalah, capital of this region is surrounded by lush farmland and coconut groves. The varied geography of Oman has resulted in a wide variety of climatic conditions. 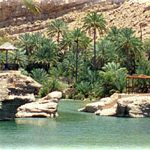 Although lying in the tropics, the Sultanate is subject to seasonal changes like the more temperate regions of the world. During the winter it is cool and pleasant, but summer on the coast is very hot and humid. The interior remains hot and dry, except for the mountains where temperatures can drop drastically at night. The hottest months are June through to August but in the south the monsoons bring light but persistent rain, resulting in a cool and misty summer. Rainfall varies but in general remains sparse and irregular. In the south, most of the year’s rainfall occurs during the summer monsoon months. In the north, the opposite occurs. Here most rain comes from occasional winter storms which descend out of the eastern Mediterranean during the months of January through March, depositing an annual average of 10 cm of rain on the capital, Muscat. If you are someone who has an understanding and appreciation of history, arts, architecture and the structure of traditional societies and government, Oman is the place for you. You can experience Oman’s sense of timelessness in the ancient interior city of Nizwa, the towns along the coast, the capital itself and the southern city of Salalah. All are steeped in history and tradition. The Sultanate enjoys an unspoiled culture and traditional lifestyle in almost every aspect. Even in its modernity, Oman is distinctly Arab and offers the visitor a glimpse of many unique old-world wonders. 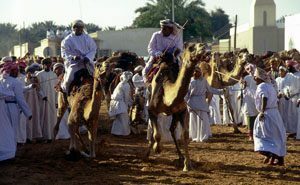 The Omani culture has its roots firmly in the Islamic religion. Oman developed its own particular form of Islam, called Ibadhism, after its founder, Abdullah bin Ibadh who lived during the 7th century. Not all Omanis are Ibadhis however; there are also Sunni and Shi’a Muslims. 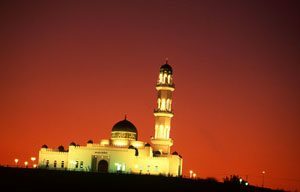 Omanis are not only tolerant of the beliefs of different Muslim sects, they are also tolerant towards believers of other faiths, who are allowed to practice their religion in churches and temples. The legacy that has been passed from generation to generation, the art, the culture, the folklore and the craftsmanship have to be seen. But there is much more in the heart of Oman to explore: the sense of respect for time, for people, and for nature. Oman’s rich heritage has been kept alive and unchanged for generations. It may help you understand tomorrow a little better. For its size, Oman boasts an unprecedented number of UNESCO-classified World Heritage Sites including Bat—with its tombs dating back 3,000 years, the Fort of Bahla, and the fascinating Frankincense Route which starts in Dhofar and includes Al-Blaid, site of the ancient city of Zafar, Khawr Rawri, Shisr and Wadi Dukah. 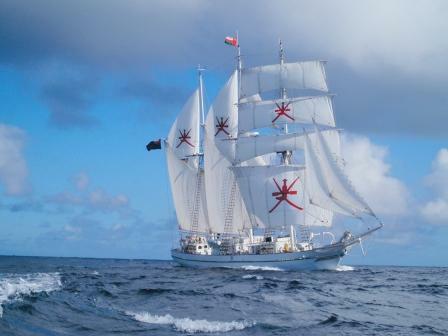 Oman’s heritage features a great sea-faring tradition, as one would expect from a country with 2000 km of coastline. Many museums and galleries around the secluded and historic harbours of Muscat, Muttrah and Sur illuminate the importance of the sea. Male dress is characterised by comfort and adaptation to the surrounding environment. The national dress is a simple, ankle-length, collarless gown with long sleeves called a dishdasha. At the neck the dishdasha is trimmed with a narrow strip, the colour of which may differ from that of the dishdasha itself. Upon the chest drapes a tassel of entwined thread; this is the furakha or karkusha, usually scented with perfume or frankincense. Underneath the dishdasha, a plain, wide strip of cloth is worn, wrapped around the body from the waist down. 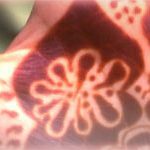 Generally speaking, the most noted regional differences in dishdasha designs are the style with which they are embroidered, varying according to age group, with more detail included for the younger generation. 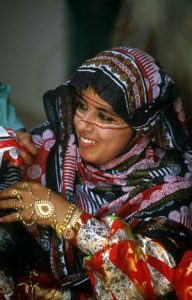 Omani women are distinguished from their Arab Gulf neighbours by their eye-catching national costumes, with distinctive regional variations. The choice of colours, particularly in the past, was linked to a tribe’s tradition. However, all costumes incorporate vivid colours and vibrant embroidery and decorations. The dishdasha or kandoorah is a long tunic whose sleeves or radoon are adorned with hand-stitched embroidery of various designs. A slit in the middle of the chest, usually red or purple, is also typical. The dishdasha is worn over a pair of loose fitting trousers, tight at the ankles, known as a sirwal. 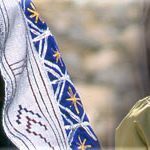 Women also wear a head shawl known by several names, wiqaya, lisso and fatqah. However, it is most commonly referred to as the lihaf. 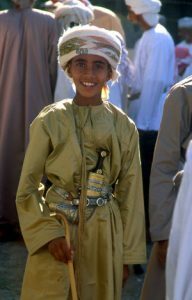 The khanjar (dagger) is worn in a leather sheath at the front of the body in a special belt, in a tradition unique to Oman. It is a symbol of a man’s origin, his manhood and courage. National dress is not complete without it and men wear the khanjar on all formal public occasions and festivals. The khanjar has played an important role in Oman’s history and this fact is reflected in the incorporation of its image into the Omani national flag. The khanjar consists of the hilt, which is made of silver, or ivory in the case of the ancient weapons, the shaft, which is decorated with bands of silver or gold wire, and the blade. The leather sheath is often intricately embellished in silver with floral or scrolled leaf filigree work. The silver used comes from silver coins which are out of circulation. One dagger takes more than one month to make. Engraving carried out on the silver shaft is a very delicate process, and entails a highly specialised skill, one requiring excellent craftsmanship and precision. These techniques are passed down through generations, and it is this which sets them apart from other daggers of the region. Oman’s numerous tourist attractions have something for everyone. From world heritage and ancient archaeological sites, to dozens of forts and castles, to mosques, souq’s and dhow’s, all provide an intriguing insight into the rich history and culture of Oman. Whist deserts, beaches, islands, mountains, caves, wadis, springs and aflaj’s provide Oman with a unique landscape where one can be swept away by its natural beauty. Adventure activities such as surfing, diving, rock climbing, camel and horse racing provide the entertainment alongside the traditional and cosmopolitan shopping, lavish hotels and restaurants.